When did humans return after last Ice Age? Focusing on 10 Millennia Ago DNA and Not interested in working with today's DNA ? Why not take DNA of an Organism, split it into 1000 to 10000 genes and introduce each of them into embryos of many huge organisms available (of course, not into humans) AND Study the effects of such a study ! I don't think you understand the moral implications of such an action. Firstly, such a study is not worth the expense without a clear purpose. Secondly, what if one of those modified organisms escapes, then the foreign gene is transmitted to the whole species and it turns out to be a catastrophic gene, leading to the extinction of that species? That kind of risk always exists with GMOs and nobody knows exactly what genetic modifications mean for the future of species. Yet more irrefutable proof that Europe belongs to and was originally the homeland of "non-'whites'". The incoming settlers are doing the right thing by slowly assimilating and displacing the 'white' immigrants illegally squatting there today. [Secondly, what if one of those modified organisms escapes, then the foreign gene is transmitted to the whole species and it turns out to be a catastrophic gene, leading to the extinction of that species? LABORATORIES are there to prevent escaping of species under research; If an useless species becomes extinct....WHO CARES? There are Trillions and Trillions of SPECIES Available. BEFORE YOU SAY THAT, ASK/TRY/ATTEMPT TO STOP WARS...Which KILL FELLOW HUMANS ! Well, I see a couple of good reasons in the above commentaries for favoring war. Though I most sincerely deny that either whitefree or betterexists deserve to be classified as MY felllow humans! I like it when scientists with political or racial agendas are allowed to contaminate the work. Nope. Scientists just look at the evidence, and publish it. This means that any other scientist is able to assess their work, and question it if necessary. I suspect the only people with racist or political agendas are scientifically illiterate trolls on comments sections such as this. A Black person would not survive in the UK with much lower levels of sun light. Rickets would development because of the lack of VITAMIN D.
If this skeleton is legit the lack of sunlight would cause Rickets,it's that simple. Why not show the skull and make comparisons that way? The nose is not of a Black person? 3% of 56 Million is 1.68 Million. TB, you certainly have made your racist ideological poltroonery putridly clear! And many of the other commentators posting to this site. Now TB, show how the evidence was manipulated to produce results you do not approve of. And I am curious. If the evidence supports the conclusions advanced by this research team? Do you have the fortitude of character to admit you were in error on this single project? @jonesdave: Even though dark skin would have been a disadvantage in England because it interferred with the body's ability to form Vitamin D, this could have been offset by Vitamin D in the diet if Cheddar Man ate large amounts of seafoods rich in Vitamin D. Note that Cheddar, England is just a few miles from the sea. Moving inland, it would have become much harder for a dark-skinned forager to get enough Vitamin D, although some freshwater fish and bird eggs would help. Over time there would have natural selection favoring the lighter-skinned members of the group, as they had more adequate Vitamin D levels. This process would have been accelerated by interbreeding with other tribal groups. After thousands of years in sun-starved England, the descendants of the dark-skinned Cheddar Man would have been lighter-skinned Britons. In the last century, dark-skinned immigrants to England would not have had this disadvantage, because Vitamin D is added to milk and other foods. WHY NOT TRANSFER These Walking FISH Genes To Other FISH? Atleast 1 species may take it ! We see dumb research from time to time - you know who does such stupid research ; Why NOT This Great One ? If something useful happens, Genetics will Soar ! Looks like the guy on the right more than the one on the left. Now, which one of those is the mother? There are plenty more examples of this but notice the importance placed on being "the first" people to arrive in a certain part of the world and how it apparently designates who the indigenous people are and who gets to claim ownership of the land? Well, ironically, as it turns out the present day "Europeans" have absolutely ZERO relation to the first people to arrive in Europe. I'm afraid that is where you have misunderstood the research. It isn't saying that these people aren't related to modern Britons - they are! About 10% of Britons share his DNA. And they are now white. The ancestors of the (white) Celts who arrived later would also have had black ancestors. As too the Romans, Angles, Saxons, Jutes, Vikings, Normans etc. 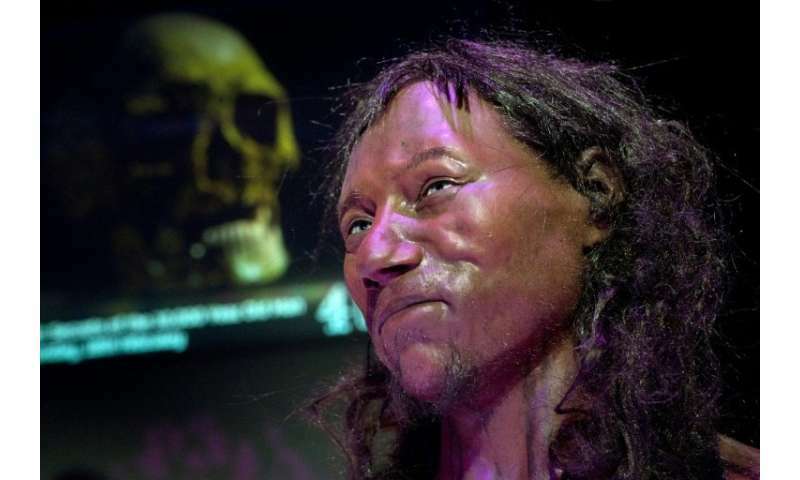 This ancient Briton may have been dark skinned, but he is more closely related to modern Britons than he is to Africans. 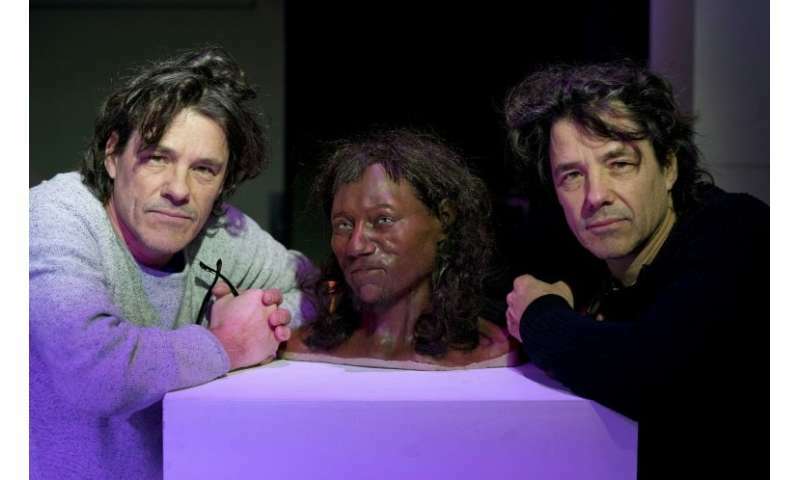 Hang on a minute, didn't the 9000 y/o person in Greece look much more light skinned. An article about her was published online on this site in, I could find a link to it when reading the dark skinned article. I have similar genetics from my maternal side (from Ireland), my grandmother was dark skinned and her ancestors are genetically traced back to Western Asia. I reckon if she had been exposed to the sun continously she would have had a similar skin tone to the dark skinned Cheddar Man. My skin would turn chestnut brown if continously exposed to the sun also, so what! My point being that an awful lot is being made out of the dark skin tone angle with full hearted and obvious coupling to pro unlimited/unregulated immigration arguments. It seems science has taken second fiddle to spin. The science is just fine. As jonesdave has pointed out, DNA testing of a 7,000 year old skeleton found in Spain showed that he also was dark-skinned with blue eyes. But when the researchers compared his DNA with other populations they discovered that overall he most closely matched the modern population of Sweden and Finland. So how could a dark-skinned blue-eyed hunter-gatherer be closely related to Swedes, who have some of the palest skin in the world? The best explanation is that this population of dark-skinned hunter gatherers evolved lighter skin to adapt to the weak sunlight of Northern Europe. I would like to know how the skin colour is determined accuratly. There are blue eyed people in Asia and North Africa who have a darker skin tone than blue eyed Europeans. There are some very dark skinned blue eyed European people who by choice expose themselves to the sun, for example Southern French "beach bum" or surfer types. The skin is a very dark shade of brown. Some people of recent Western Asiatic and African hertage have very light skin, especially if not exposed to the sun. From the DNA testing, can it be known what the actual skin tone of the person was (what the person actually looked like) or what the skin tone could look with maximum exposure to the elements? -Physiological factors that regulate skin pigmentation, Yamaguchi, Hearing - Biofactors. 2009 Mar–Apr; 35(2): 193–199. So, if twins with blue eyes are born in Southern France but seperated at birth, one stays on the beach in France playing volleyball and other spends the rest of his/her life in a valley in North Wales, or in a forest in Scotland - when they both pass away, will the DNA information determining which skin tone (assuming they had similar nutritional intakes) they might have had be the same, or different? They would look very different. when they both pass away, will the DNA information determining which skin tone (assuming they had similar nutritional intakes) they might have had be the same, or different? If DNA test fail on living people how are they 100% on 10,000 year old DNA? DNA tests fail on identical Triplets? If you look closely, you can see a certain resemblance to the Queen. The bigot whitefree_europe thinks it's only 'whites' who outgrow and overrun their neighbors. In truth most areas on all continents have been successively overrun as wave after wave of refugees escaped overpopulation in tropical lands. Euros are only tropicals in the process of becoming temperate. Their white skin is only one indication of this transition. Another indication is that before industrialization, their reproduction was becoming seasonal, as in June weddings and spring fertility rites. Neanderthal probably disappeared because they only mated in early summer, and they couldn't replace battle losses as fast as the cromags. The stinking bigot whitefree_europe can't admit that his tribal hatred of euro indigenes prevents him from being objective. He wants all whites to leave because his culture tells him that the world is meant to be filled up by his tribe alone. Allah says so in the book that he wrote. I really don't think someone who uses the nick 'whitefree_europe' is xian. Do you? But I do think his opinions are religiously inspired. His bigotry is typical. Do you think he would have the guts to own up to it? BTW whether Allah = Jehovah is a very contentious question yes? Believers on both sides would claim that one is a corrupted rendition of the other. Im white so i cannot be using that sort of nick, would I? What the hell are you talking about? You did read the thread didnt you?? And who do you think that referred to? So why did you think I was using it to refer to you and not him? -implying that otto was calling him 'whitefree europe' as if he wasn't aware of this posters existence in the thread. Seems to me seeker just doesn't have the guts to admit he was too lazy to read the thread before commenting on it.